The operation – code name “Operation Ajax” – took less than a month in the summer of 1953. The number of anti-colonialists, dissidents, protesters and revolutionaries killed after the overthrow of Mossadegh and during the 79′ Revolution range between 3,000 to 60,000. The Eisenhower administration viewed Operation Ajax as a success as it returned the Shah to his Peacock Throne. After the Shah was placed in power, the oil industry was denationalized, the British-led oil embargo against Iran ended, and oil revenue increased significantly beyond the pre-nationalisation level. Despite Iran not controlling its national oil, the Shah agreed to replace the Anglo-Iranian Oil Company with a consortium—British Petroleum and eight European and American oil companies; in result, oil revenues increased from $34 million in 1954–1955 to $181 million in 1956–1957, and continued increasing. In March 1975, subsequent to discussions at an OPEC meeting, Iran and Iraq agreed to meet and negotiate their dispute over borders and water and navigation rights. This meeting resulted in the Algiers’ accord signed June 13, 1975. During the convocation of the OPEC Summit Conference in the Algerian capital and upon the initiative of President Houari Boumedienne, the Shah of Iran and Saddam Hussein (Vice-Chairman of the Revolution Commacil) met twice and conducted lengthy talks on the relations between Iraq and Iran. The thalweg, meaning the median course of the Shatt-El-Arab waterway, was designated as the border. The agreement caused the Shah of Iran to withdraw Iranian support for the Kurdish rebellion, which thereupon collapsed. 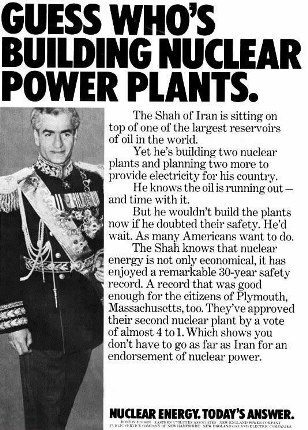 The Shah managed to hold onto power until Jimmy Carter assumed the presidency in 1977. Carter inherited a relationship with Iran and the Shah set in place by Nixon. His increasing repression set off the explosion of the late 1970s, which brought to power Ayatollah Ruhollah Khomeini and the anti-Western Shi’a regime that has been in control ever since. After the Iranian government had been overthrown by an Islamic revolution in 1979, and the Shah sent into exile, Khomeini returned to Iran, where millions of people were waiting enthusiastically to greet him. In response to the exiled Shah’s admission to the United States in September 1979, a large crowd seized the US embassy in Tehran, taking 52 American citizens hostage. After 444 days of economic sanctions, diplomatic negotiations and a failed military rescue, the release of the remaining hostages was finally secured. In February 1989 Khomeini broadcast a fatwa on Tehran Radio, issuing a death threat against British author Salman Rushdie and his publishers, over the book Satanic Verses. Later that year on June 3, 1989, Khomeini died.